The Art of Living Foundation launches a nationwide meditation campaign with a series of meditation talks by Sri Sri. “The ‘Secrets of Meditation’ series is an incredible opportunity to experience deep meditations and profound knowledge with a revered spiritual teacher,” said Michael Fischman, president of the Foundation. The Art of Living Foundation announced that international spiritual leader and peacemaker Sri Sri Ravi Shankar will bring his timely message of individual empowerment and human values to Los Angeles, April 18-22. His visit marks the launch of a national campaign that offers a solution to the challenge of stress, helping individuals empower themselves to live a life of greater happiness and fulfillment. 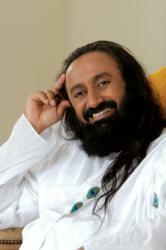 Sri Sri will lead a three evening series titled “Secrets of Meditation,” April 19-21, 7.30p.m. He will also provide a commentary on a key Upanishad during his visit. The Upanishads are ancient texts that contain knowledge of living life in higher states of consciousness. In all of these forums, Sri Sri will bring out knowledge in a way that is relevant to modern life and instill participants with a sense of greater peace, awareness and happiness. “The ‘Secrets of Meditation’ series is an incredible opportunity to experience deep meditations and profound knowledge with a revered spiritual teacher who makes life’s profound truths accessible in a simple manner,” said Michael Fischman, president of the U.S. Art of Living Foundation. Named one of the five most powerful people in India by Forbes, Sri Sri has inspired a global phenomenon of compassion and service through his campaign to create a violence-free, stress-free world. His initiatives in conflict resolution, trauma and disaster relief, business and social responsibility, prisoner rehabilitation, youth leadership, women’s empowerment, PTSD relief, and education, and his programs of meditation, breathing, and self development have impacted the lives of more than 30 million people worldwide. In particular, the Youth Empowerment Seminar (YES!) programs are helping thousands of young people in inner city high schools in Los Angeles, New York, Chicago, Baltimore, Washington, D.C., and New Orleans, where children and teens have reported reduced stress and improved performance. This will be Sri Sri’s third visit to the Art of Living’s new Los Angeles Center, which was inaugurated in April 2010. A historic landmark building in the West Adams district near USC, the Center has already established itself as an instrument for community upliftment through its breathing, meditation, yoga, and knowledge programs, as well as ongoing cultural events and forums designed to build bridges of understanding between the city’s diverse communities. The Sri Sri-founded partner organizations, the Art of Living Foundation, International Association for Human Values, and Ved Vignan Mahavidyapeeth (VVM), have collaborated to offer self-development programs for adults, corporate leaders, leadership development for young adults, summer camps for children, as well as specialized programs for returning veterans, people with HIV and their caregivers, and international cultural events. Sri Sri’s flagship Art of Living Course is taught in 151 countries, and numerous studies on its core breathing practices have been published in peer-reviewed medical journals. For more information on Sri Sri’s upcoming programs, visit artoflivingLA.org.